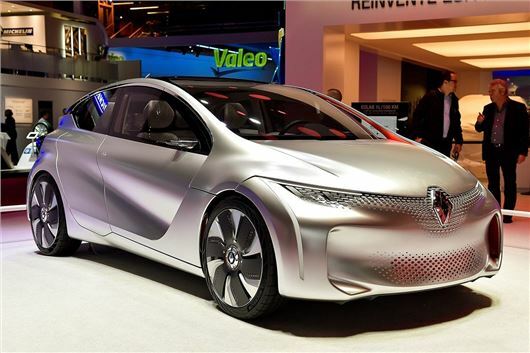 Renault has unveiled the Eolab technology demonstrator at the Paris Motor Show. The futuristic-looking concept car isn’t set for production. It showcases more than 100 fuel-economy focused technologies set to appear on production Renault models by 2020. All of these technologies, including a hybrid powertrain, combine to give the Eolab fuel economy of 282mpg. Features include an ultra-low drag coefficient thanks to aerodynamic styling, along with active aerodynamics which change depending on speed. The Eolab is also exceptionally light, thanks to details like thinner glass and a magnesium roof. Power comes from a 75PS petrol engine linked to a clutch-less transmission with three speeds. In the clutch housing is an electric motor to provide extra torque. The car can run in zero-emissions mode up to around 40 miles, after which the petrol motor kicks in. The Eolab is billed as just a concept, so don’t expect to see it in showrooms – however you can expect to see future Renault models adopting the lightweight approach, along with the new hybrid system. Some details of the aerodynamic styling may appear in the next-generation Megane.